Beaune is a wine appellation that produces high quality Burgundy from vines planted in the commune of Beaune situated in the Côte de Beaune region of the Côte-d’Or. The city of Beaune itself is the second largest (after Dijon) in France’s Burgundy department. By tradition, Beaune was founded about 52 B.C. as a camp for Julius Caesar’s army as it prepared to defeat the Gaul’s legendary hero Vercingetorix. 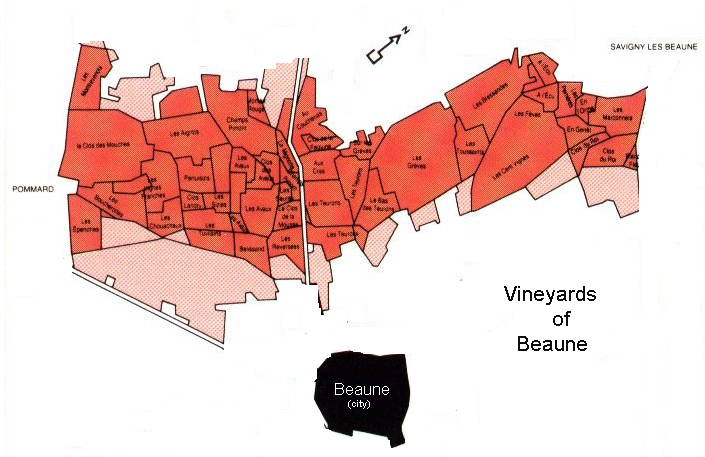 The name “Beaune” derives, according to Clive Coates, from Belno Castrium, which would have referred to a fortified small villa. By 1602, Beaune was being referred to in a contemporary map as “Belna (commonly called Beaulne)”. During the Gallo-Roman period, Beaune served as a way station along the road to Autun, then the capital of Burgundy. As the importance of Autun diminished, first following its conquest by the sons of Clovis in 532, and later after its sacking by the Saracens around 730, Beaune began to emerge as an urban entity in its own right. 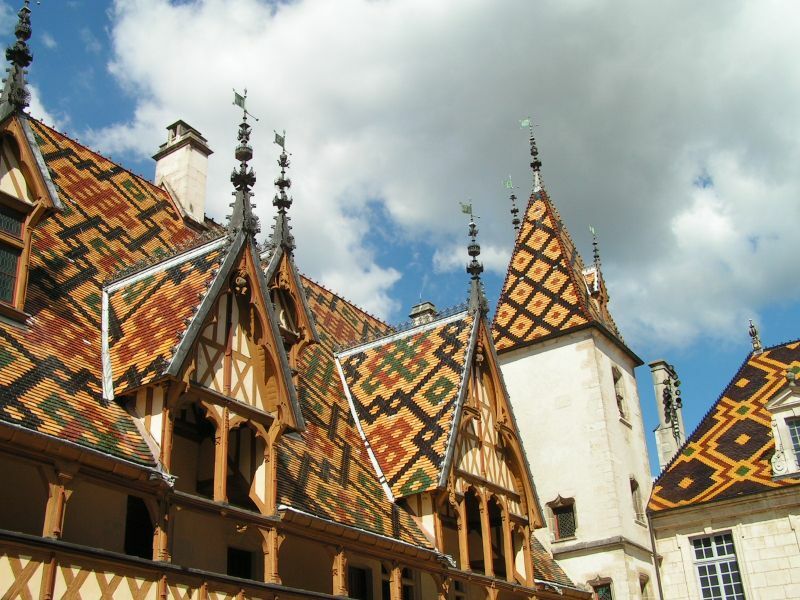 Formally chartered as a city in 1203, Beaune remained the residence of the Dukes of Burgundy until the late 14th Century, when Phillip the Bold married Margaret of Flanders, and moved the ducal court to Dijon. 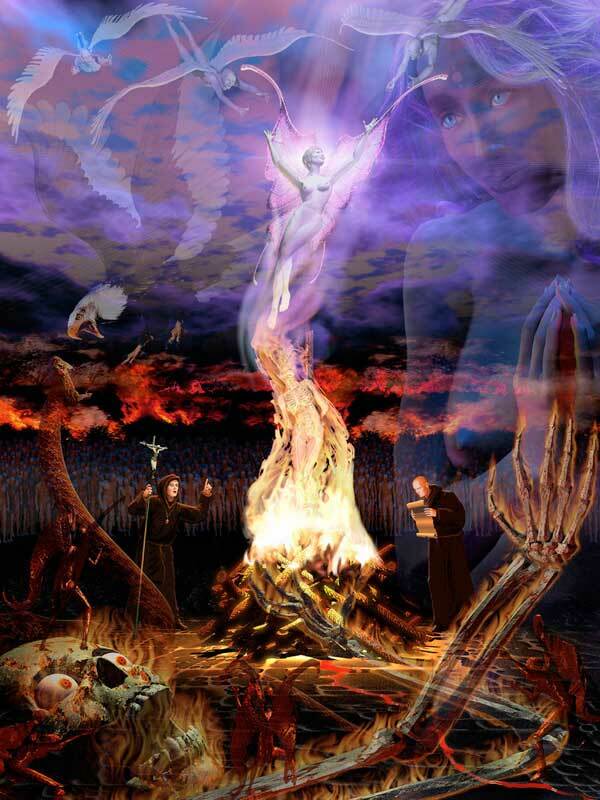 During the latter part of the Hundred Years war, in 1401, a fire destroyed Beaune. After the Treaty of Arras in 1435, first Louis XI and then Charles XIII, constructed the pentangular castle and massive fortified walls that continue to define Beaune. The Hôtel-Dieu (Hospices de Beaune) was built during that same period under the direction of Phillip the Good, Duke of Burgundy, whose chief claim to fame is that he betrayed Joan of Arc to the rosbifs, who promptly burned her at the stake. Beaune has been celebrated for its vineyards at least since Gregoire, Bishop of Tours, wrote his history of France (Historia Francorum) in 570. Today Beaune continues to boast some of the finest vineyards in the world. The entire appellation comprises 531 hectares, the majority of which, 337 hectares, is within 44 climats that are, in whole or part, designated Premier Cru. In addition, the appellation consists of 138 hectares of village-level Beaune and 66 hectares from the related AOC Côte-de-Beaune. The vineyards are situated on gentle slopes northwest of the city and thus enjoy, in general, favorable southeastern exposition. The sloping hillside on which the Premiers Crus lie, begins at the border with Pommard and extends in a northerly direction until it meets the border of Savigny-lès-Beaune. The vineyards are bisected by the N470 as it crawls up the hill toward Bouze-lès-Beaune. Most critics believe that the best section lies to the north of this road, where the soils are a mix of gravel and iron-rich clay over a limestone base. This sector, celebrated even in the 19th Century, includes Les Bressandes, Les Perrières, Les Grèves, and Les Marconnets, and produces the most complex wines of the appellation. Further north of this sector, toward the border with Savigny-lès-Beaune, the soil becomes thinner, especially in the steeper upslope vineyards. South of the N470, the soil becomes more sandy, and occasionally quite stony. While 95% of Beaune vineyards produce red, Pinot Noir-based Burgundy, a few of the vineyards in this sector, notably the famous Le Clos des Mouches, yield excellent white Burgundy. In the central portion of this sector are found two remarkable vineyards, Les Aigros and Les Sizies, whose sandy, limestone soils give rise to elegant and subtle red Burgundies of a charming, somewhat lighter style. The vineyards downhill from Le Clos des Mouches, tend to flatten out as they extend toward the RN 74, and have deeper soil with a higher proportion of clay. This last sector, known locally as Le Puits de Beaune (“Beaune’s well”), and accordingly suffering from poor drainage and risk of frost, is not a reliable source of fine wine. 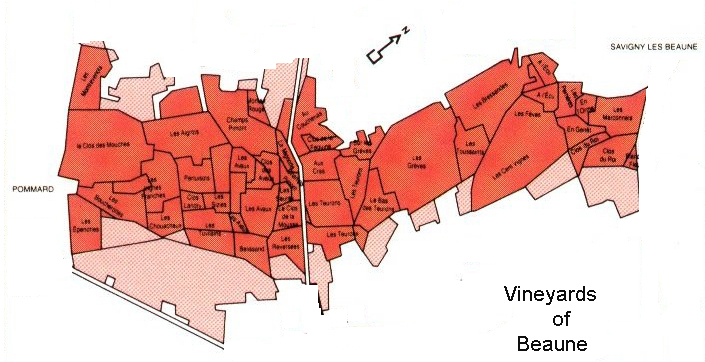 The size and wealth of Beaune as a city have resulted in two salient consequences: (1) the high proportion (arguably not fully justified) of Premier Cru climats in the appellation; and (2) the dominance of the large négotiant houses (e.g., Drouhin, Bouchard Père et Fils, Bichot, Patriarche) headquartered in the city, within the ownership and politics of the appellation. Although a couple of these négoces do in fact produce exemplary wines from the Beaune AOC (Bouchard’s Vigne De L’Enfant Jésus, from a lieu-dit within Les Grèves, and Drouhin’s Clos des Mouches), the preponderance their wines have contributed to the unfortunate and lackluster reputation of the appellation. Not surprisingly, some of the finest wines from Beaune come from Domaines originating in other appellations but with small holdings in Beaune: Domaine de Montille ( Les Grèves, Les Sizies, Les Aigros, Les Perrières), Domaine Lafarge (Les Grèves, Les Aigros).